Waterstone provided support for the State of Colorado for the Republican River Compact Litigation (RRCL), an inter-state water rights case currently before the U.S. Supreme Court. Waterstone’s provided the framework for collection, storage and transmittal of data between the various participants of the State of Colorado’s RRCL engineering support team, ensuring both the timely and accurate dissemination of data among the team participants, and confidence in the project data. Waterstone developed a geo-spatial data management system to handle all hydrologic, hydraulic, or environmental data used by the project team. This database used customized Visual Basic tools to enter, track, manage, and extract data. The design of this MS Access database ensures that all tabular data, GIS vector, raster and DEM data, and photographic and text documents are entered into the database with the source, data entry event, and data entry QA event documented within the database. A comprehensive data sources tables tracked the source of all data incorporated into the system. Waterstone worked collaboratively with the surface water and land use contractors and the Division of Water Resources to develop a statistically representative and defensible field-sampling program based on a select number of irrigated parcels for each sub-basin in the Republican River watershed. Waterstone used this sampling data as ground truthing in their satellite imagery classification of land cover, which included the delineation of irrigated lands. Waterstone provided the statistical support and analysis to this effort, and additionally has used GIS programming to automate the production of verification maps for field personnel. Waterstone currently provides database management support for the Colorado Department of Transportation Materials Testing Lab environmental remediation program. In addition to maintaining and updating both air and groundwater sampling results for some 450 discrete locations, Waterstone has developed a browser-based CD-ROM that allows the broad range of project stakeholders to easily query sample data via an intuitive map-based interface. Using automated database update programs developed by Waterstone, new versions of the CD-ROM based digital report with the most current data can easily be produced, allowing timely analysis of the changing environmental conditions. The U.S. Department of Energy and Kaiser-Hill, completed safe cleanup and closure of the former Rocky Flats Nuclear Weapons Facility. Additionally DOE committed to an accelerated schedule that called for closure of the site by December 2006. 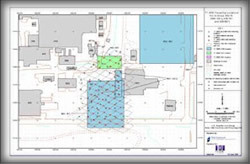 Waterstone created a unique environmental data management system (Remedial Action Decision Management System, or RADMS) to improve efficiency of remediation activities, notably in three processes: documentation preparation, review, and approval; the regulatory interface; and the characterization-remediation interface. Waterstone’s lead role in providing the system architecture, design, code and subject matter experts for the RADMS software was key to the success of this project.